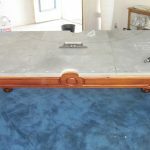 Some of you may be wondering, “How does a new pool table get inside my home?” Well, I hope this post helps. These photos are from a recent delivery to Lake Forest, CA. 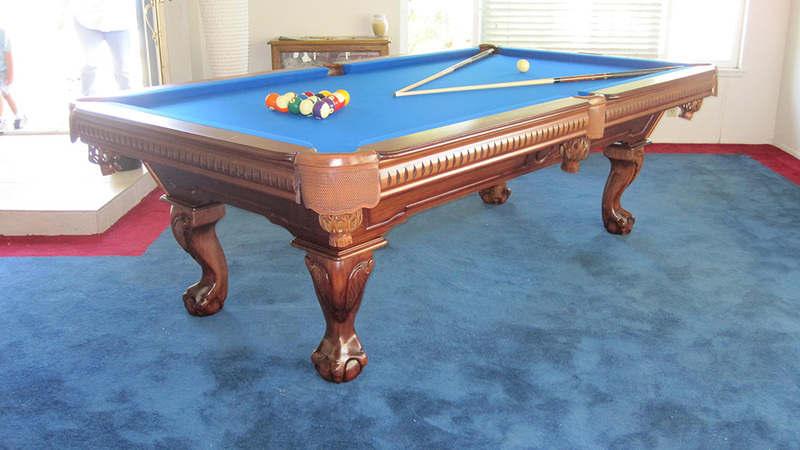 This model is a Presidential Billiards 8′ Chestnut “Capetown” with Euro Blue cloth. First, I start by building the cabinet. 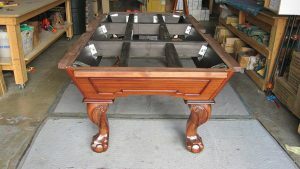 The cabinet is the part of the pool table that supports the 3pc. slate bed. 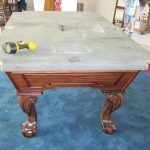 The slate bed is where the billiard cloth (sometimes called felt) is attached. 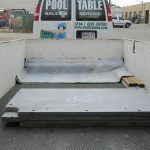 The slate also supports the rails (sometimes called bumpers) and pockets. Once I have the cabinet built I start to install the cloth onto the rails. Then we load all the parts that make up the whole pool table into my trailer and deliver it to our customer’s home. Once inside customer’s home we discuss the best possible position for the new pool table also keeping in mind other furnishings that may be incorporated into the new “gameroom”. 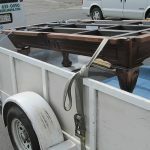 After the cabinet’s ideal position is chosen, we one by one start carrying in the very heavy pieces of slate that make the playing field of the pool table. When all three pieces of slate are on top I square and center it to the cabinet. Then I secure the slate to the cabinet using screws. At this point I start to level the cabinet and the slates with my “Starrett 98 Machinists’ Level” (a very, very, very accurate level). After this process I seal the slate seams with pure bee’s wax, leaving a “smooth as glass” finish. Now the bed cloth (aka felt) is stretched and stapled onto the slate liner. As I’m installing the bed cloth, my assistant assembles the rails and pockets into two “U” shaped components. 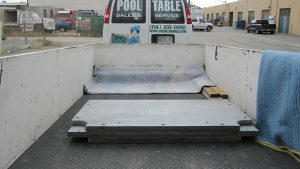 We attach the rail components to the slate bed, align the side rails then bolt them down. We fasten the pockets to the table. Then YOU break the first rack of balls on your new pool table!